OSB, or oriented strand board, is manufactured wood with a look and usage similar to plywood. It is used in buildings and some furniture construction. 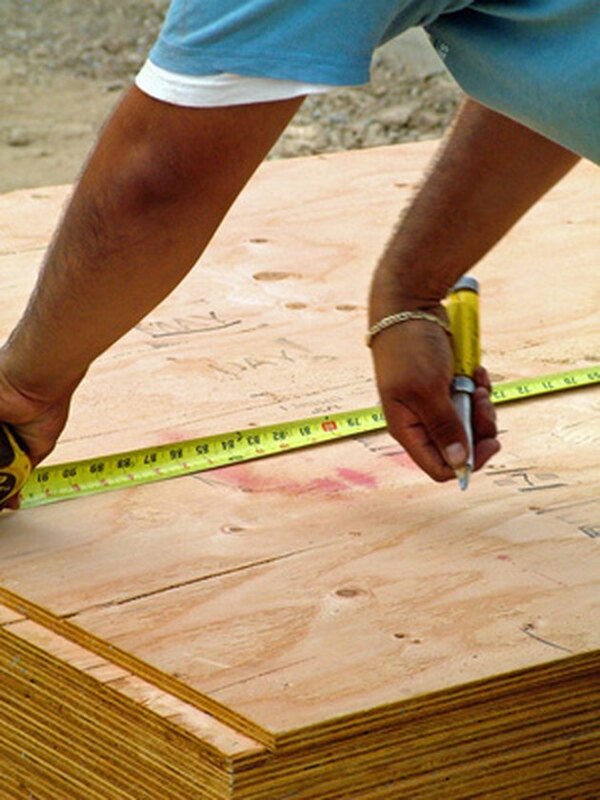 After the OSB panels are formed, they are stamped with information about the grade, strength, and usage. OSB is often colored down the side to indicate thickness and grade. Many types of paints and inks are used to mark the wood, so removing the stamps involves trial and error. Saw off, with a circular saw, any paint or marking along the side of the OSB board. There is no other good way to remove a stain on the side edge, which is often porous. Pour some rubbing alcohol onto a cloth. Rub it against the OSB stamp several times to see if the stamp becomes any lighter in color. Dampen a corner of a cloth with fingernail polish remover and rub it against the stamp several times. If the stain lightens, continue rubbing. Mix a paste of 2 tsp. baking soda and 1 tsp. of water. Spread it onto the ink stamp and then wait about 10 minutes. Use a damp rag to remove the paste, scrubbing the stamp as you do so. If the stain has lightened, continue to apply the paste mixture and rub it away until the stain is gone. Sand the stain with 60- or 80-grit sandpaper. Sand in the direction of the wood's grain. Be careful to only sand as deep as necessary to remove the stain so that you don't create a low point in the OSB.